1 Dog Collars. Many people buy a dog collar because of the look of it or a friend or shop owner recommended it. Dog collars can be made out of many materials and have many catch mechanism, but the one thing that most owners fail to consider, is that a collar is for more than just holding their name tag and registration tag. A dog’s collar should be in good condition, properly maintained, and if they like to roll in wet grass or take dips in puddles, many materials will either stretch or tear. Other dogs will grip onto a collar in play, some metal catches rust, some plastic catches lose the tongue that maintains the catch closing securely. A collar (when a dog is walked with it secured to a lead) is repeatedly tested for breaking. Stress fractures can easily accumulate on any collar, so these should be replaced every year or so, even if you can’t see any damage. A collar is actually for restraining a dog when walking, and for a dog walker, particularly for use when crossing busy roads to and from a car. It should at most have a one to two finger gap between the collar and the dogs neck. If it doesn’t, and a dog sees something that it really wants to chase, you are likely to end up with an injured or dead dog. Collars regularly stretch with wear and with pulling, they should regularly be checked for proper fit. When an owner has given up on using a regular collar to walk their dog (and don’t go to dog training classes) then they are often recommended to use a halti. These are restrictive face or body restraining devices that when a dog pulls on them, puts an uncomfortable level of pressure on the head to turn back to the owner, or a tightness on the chest. Ideally the pressure has the dog reduce its pulling. If these work on your dog for the short term that is fine. If not you may consider a correction collar or a martingale collar. Many dog training clubs demand the use of correction collars (or inappropriately named choker metal collars) to assist in training while dog walking. If the links are wide enough they don’t cause damage to most dogs windpipes. However if you can’t bear that thought, then a martingale collar is an ideal halfway house that will still provide the dog with the sounds of the links tightening while also having some soft collar part to ensure that they won’t have their entire neck encased in a metal chain. Dog leads have the same issues with wear and tear. Checking that they are secure (no ripped stitching or loose rivets) and replacing them every few years at the most, is always advised. 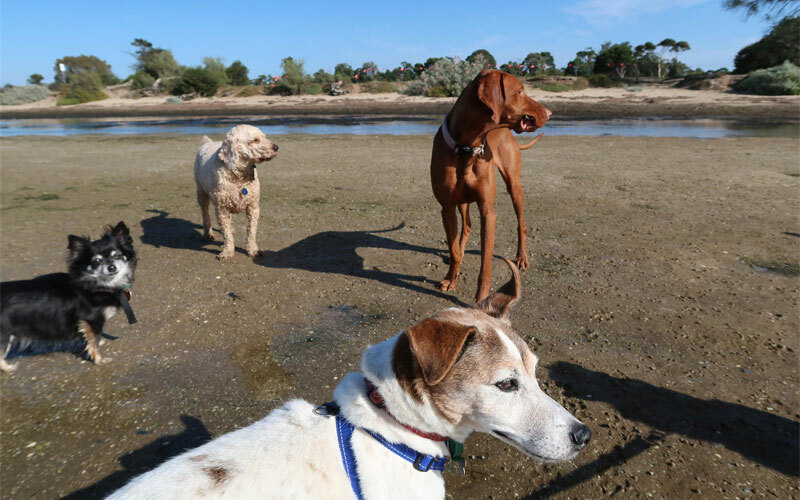 NOTE – the whole point of our dog walking services is to get dogs to a level of socialisation that they want to stay with the pack, and can walk safely with us in legal dog parks , off lead. This means that the collars and other devices will only be on the dogs until they are safely in the park, but getting them to and from the park safely still requires a consideration of the above. Plus if we are on a pet sit, we walk dogs for 15-20 minutes around the block near the owner’s home. This will definitely require full control of a dog and so a dog being comfortable and relaxed while being walked, to maintain full safety.